Like any sport, hockey has its traditions, its idiosyncrasies and a dedicated fan base. Many of the traditions kick in around playoff time – the drive for the Stanley Cup.� Bring these three elements together and you have a formula for some real zany behaviour, such as the things that fans bring with them to a game to throw on the ice. 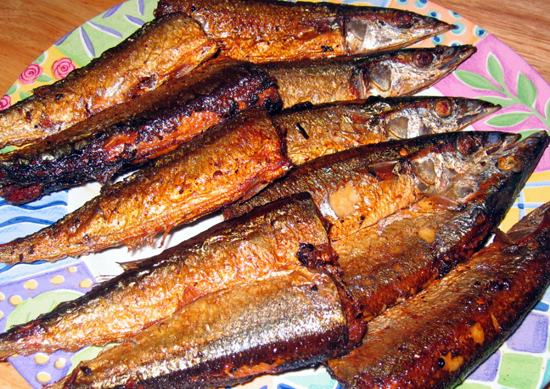 Many teams have traditions about what is thrown to the ice under certain conditions, from live seafood to white towels. This list presents ten such traditions that are unique to the world of hockey, especially during Stanley Cup playoff time. Thrown when a player scores 3 goals, which in the hockey world is known as a hat trick. This tradition dates back over 90 years. 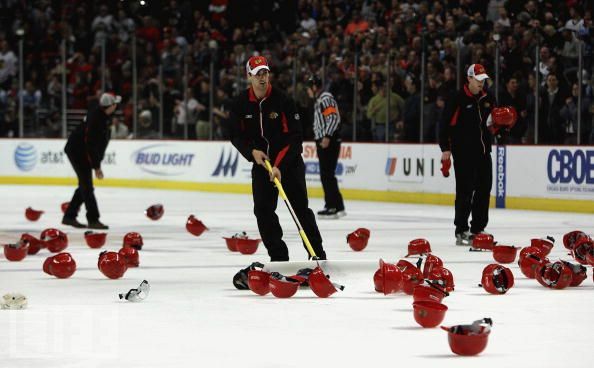 During the 1970s, fans built on that tradition by tossing hats on the ice, and the NHL eventually amended its rule book to say that “articles thrown onto the ice following a special occasion (i.e. hat trick) will not result in a bench minor penalty being assessed” to the home team for delay of the game. The hats typically end up in either the trash or being donated to charity, depending on the condition of the cap. In the Western Hockey League in North America there is a tradition that teddy bears – stuffed animals – are thrown on the ice after the first goal of the game, which is known as the “Teddy Bear Goal”. Fans throw teddy bears onto the ice that are later donated to children’s hospitals and charities. In this video clip from November 2009, triggering one of the most amazing sights in all of sports, Spencer Bennett of the Portland Winterhawks (Portland, Ore.) scores the “Teddy Bear Goal” at 2:52 of the first period against the rival Seattle Thunderbirds in front of 10,197 fans in the Rose Garden. The 10,000 fans threw 16,321 bears, which were were collected and donated to children’s charities. There are a number of Cornell traditions that take place at sports events, and in particular when the school plays the Harvard hockey team. One is to bring a newspaper, and when the opposing team�s line-up is announced, every fan pulls out their paper and starts waving it in front of themselves, chanting �boring� over and over. Another is to throw fish. This tradition began in 1973 after a Harvard fan threw a dead chicken onto the ice at the Cornell goalie, supposedly to make fun of Cornell�s agricultural college. When the game was held at Cornell later that year, Cornell fans started throwing fish onto the ice to make fun of the fishing industry in Boston. 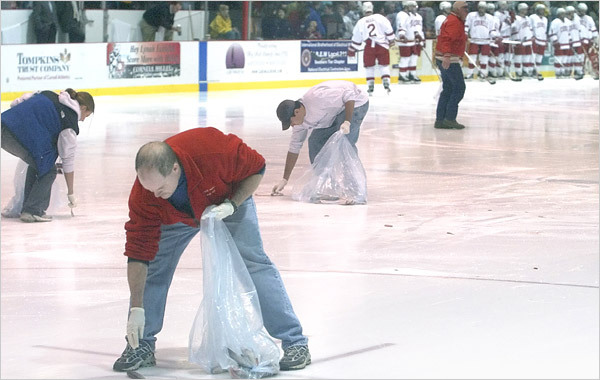 Cornell fans at Lynah rink continue to throw fish onto the ice to this day. 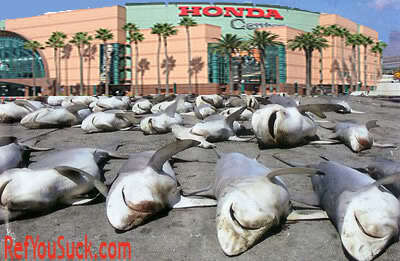 Any fan caught throwing fish can be ejected and have their season tickets taken away, so this is not without some risk. With this tradition, the towels typically are waved by fans in the stands, though they sometimes end up on the ice. In 1982, the Vancouver Canucks were playing the Chicago Blackhawks in the Western Conference finals as they moved towards the coveted Stanley Cup. During the second game, the refereeing was absolutely horrible. The ref called nine penalties against the Canucks and disallowed one of the team’s goals. 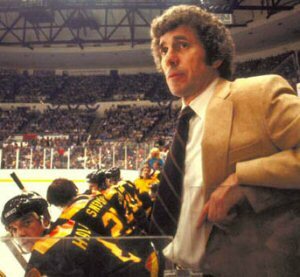 To protest the ref’s poor eyesight, the Canucks’ coach, Roger Neilson, waved a towel on the end of a hockey stick to signal surrender. 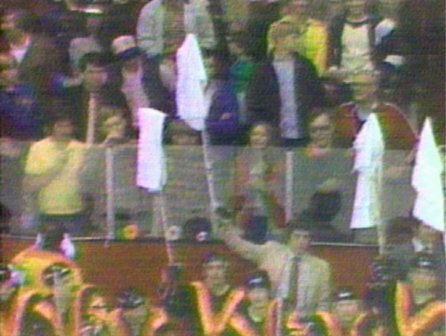 When the Canucks returned to Vancouver for their next game, thousands of fans waved white towels – as a tribute to Roger’s protest. The tradition became known as Towel Power and is now used by sports fans all over North America. Towel power - Vancouver Canucks. 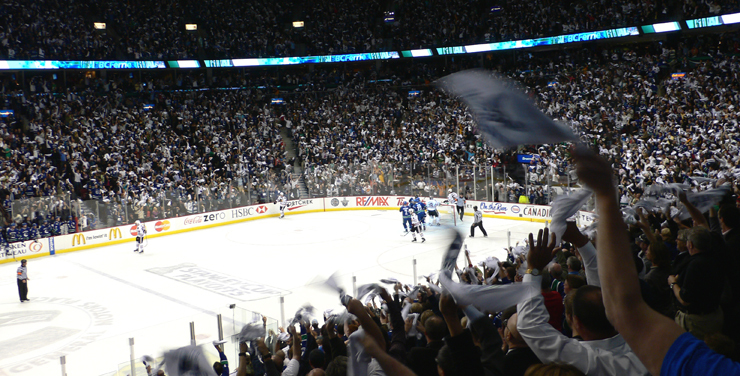 Fans wave their towels in the air to celebrate Canucks playoff games. Oilers fans created their own rendition of tossing stuff from the crowd, throwing Alberta beef on the ice during their Stanley Cup playoff run. 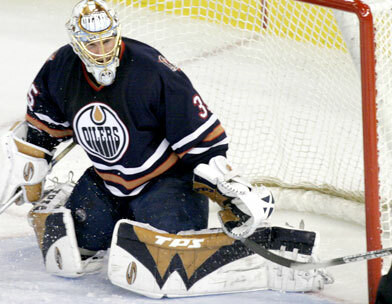 An Edmonton radio personality suggested that Oilers fans should respond to Detroit’s octopus tradition by hurling Alberta beef to the ice during Edmonton’s first-round series against the Red Wings in 2006. Oilers fans continued throwing steaks, even at away games, resulting in several arrests at the away cities. The San Jose hockey team is called the Sharks, and with the actions of one fan, there may be a tradition developing. 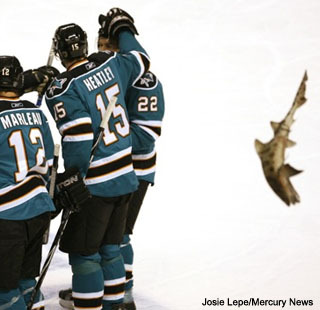 A real shark was thrown on the ice during a playoff game in 2010. The fan who threw the live shark onto the ice said that he was acting in response to Detroit fans, who toss squid on the ice with a goal scored by their team. Apparently the group smuggled it in to the stadium under a pair of loose sweat pants, where the shark was strapped to someone’s leg using an ace bandage. 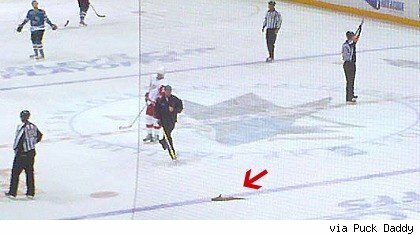 In the second game of the 2009-10 playoff series between the Detroit Red Wings and San Jose Sharks, a small shark was tossed to the ice with an octopus inside its mouth, in reference to defeating Detroit by the San Jose team. 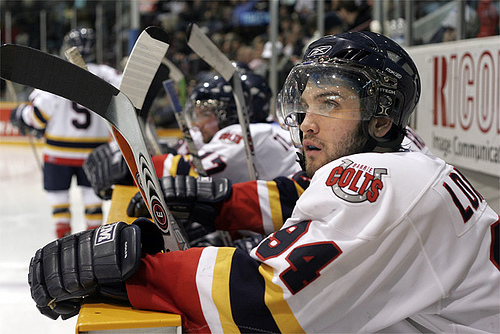 In the opening game of the 2010 Ontario Hockey League final, the Barrie Colts thought it would be a great idea to hand out boxes of macaroni and cheese as noise makers before the game. When the contest was over, fans were supposed to deposit the boxes into bins which would then be delivered to a local food bank. Unfortunately when Windsor Spitfires forward Taylor Hall scored in overtime, the boxes came flying onto the ice. 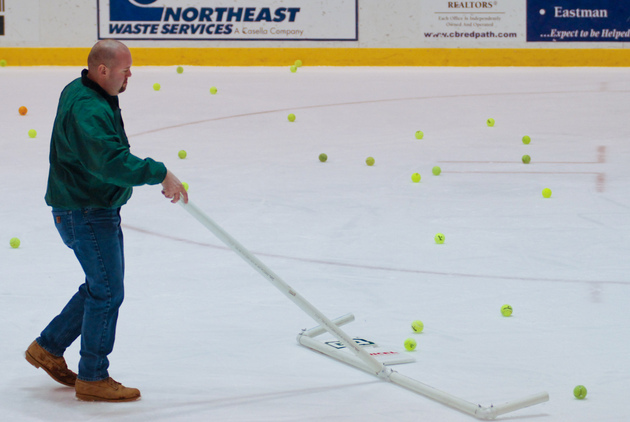 In American college sports, the Dartmouth-Princeton hockey game includes one of the few enduring Big Green sports rituals — the tennis balls. Every year when the the teams play the fans unleash a barrage of tennis balls onto the ice after Dartmouth’s first goal of the game. The fans go nuts, the cleaning crew goes out to gather the balls and Dartmouth gets a two-minute penalty for delay of game. All in the name of tradition. 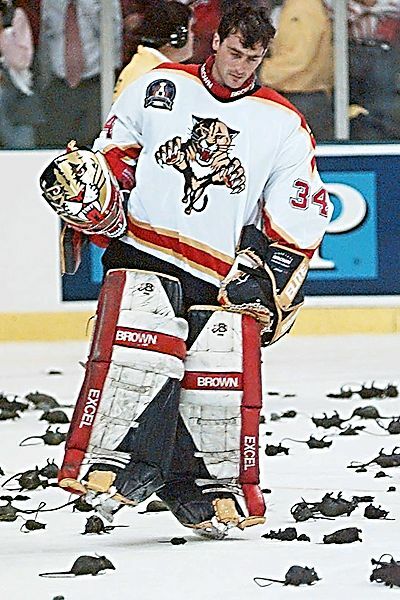 Panthers winger Scott Mellanby killed a rat with his stick in the team’s locker room prior to the 1995-96 season opener. Then he scored two goals that night. A few fans threw plastic rats in subsequent games when the story was first reported. 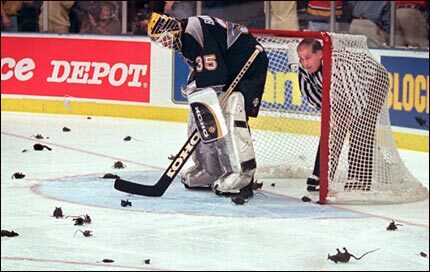 By the time the Stanley Cup finals rolled around, Florida fans were chucking plastic rats by the thousands after the Panthers scored a goal. The team even secured a sponsorship with Orkin pest control. 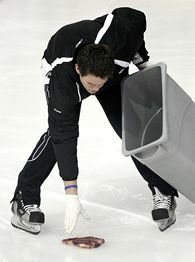 Team employees wore Orkin uniforms while clearing the ice surface of the plastic rodents. 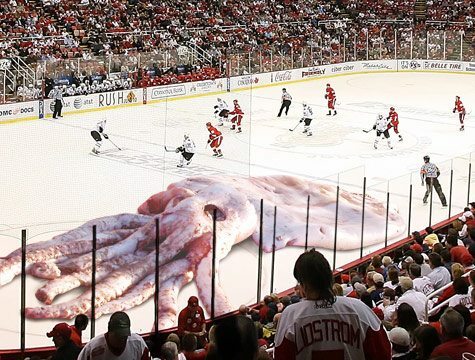 The throwing of the octopus has been a playoff tradition at Detroit Red Wings games dating all the way back to the early 1950′s. At the time, NHL teams needed to win only eight playoff games to hoist the Stanley Cup, and the eight tentacles on the Octopus were supposed to represent each win that was needed to claim hockey’s ultimate prize. Even though the league, and Stanley Cup playoffs, have since been expanded (it now takes 16 wins to win the cup) the tradition still goes on at every Red Wings playoff game at Joe Louis Arena, and most road games that have a large contingent of Wings fans present. Note that this tradition is a playoff thing, so generally the team has to be doing well in the playoffs before you see one. Interestingly, during the 2008 Stanley Cup finals, in which the Detroit Red Wings defeated the Pittsburgh Penguins, seafood wholesalers in Pittsburgh asked for identification from customers who purchased octopuses, and refused to sell any octopi to buyers from Michigan. I really enjoy what you write here, very refreshing and smart. One problem though, I’m running Firefox on Ubuntu and parts of your content are a little misaligned. I realize it’s not a popular setup, but it is still something to keep an eye on. Just giving you a heads up. I love the hat trick tradition, but with the price of hats I am surprised that so many people do it.